I've recently been feeding my scented candle obsession with an offering from new British brand Evon Candles and I have been so impressed that i wanted to feature it in my 'Under the Spotlight' series where i give you the low down on a new brand that i think you will want to know about, and i am certain that there are a few other candle addicts amongst us whose ears will be pricking up! 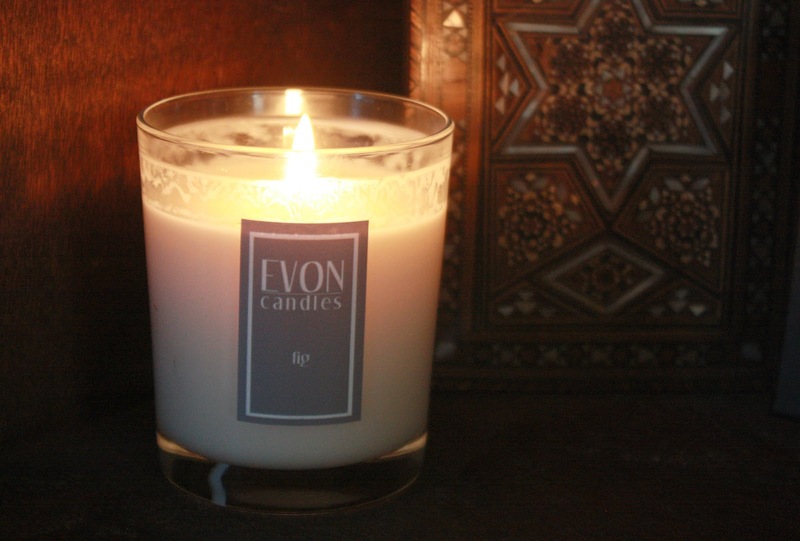 Evon Candles are made from soy wax and fine fragrances and are individually hand poured (which makes the £15 price tag a total bargain) There is a gorgeous range of fragrances, I have fig which is always a winner with me and this one hits the nail on the head because it has that balance between being quite green and fresh, but also quite earthy and warming. The green orange and coriander and the rhubarb and blackberry are both destined to find their way onto my bookcase soon (don't they sound good enough to eat?!) but i can honestly say i would happily burn any of the fragrances in the range. The packaging is standard for luxury scented candles with the glass jar and the sophisticated, understated label in a grey colour which i like because i think it would be just as at home in any room of the house. The candle arrived in a study black box with tissue paper so it would make a lovely gift and as soon as you open the box the air is filled with the gorgeous fragrance. I have never known a scented candle to give off such a strong scent when it isn't even lit and i have tried candles from all the expensive luxury brands out there! The fragrance when burning is true to the unlit scent and it is really strong without being overpowering or sickly. It has approx 30 hours burn time and as with all candles it is recommended that you burn it for a minimum of an hour and no more than three but after an hour your whole room is filled with fragrance so i think this will last a while. I am so impressed with this candle and i just can't believe how affordable it is; they all retail for £15 but there is an additional 20% off throughout December bringing the price down to £12 which is just incredible when you consider how much you would pay from a candle of this size from the big boys (Diptyque, Malin & Goetz, Jo Malone etc) If you have always fancied trying an expensive, luxury scented candle but not been able to part with £40 i cannot recommend Evon candles enough, you will not be disappointed! I would love to try these candles but I am scared to use them because I am scared of fire -_- I know its weird (: great post! Christmas gift idea - give a memory!